In the autumn of 1938, just after the dramatic and tragic days of the four-power agreement in Munich concerning Czechoslovakia, Mondrian left France, feeling that war was imminent and that Paris was easy prey for the Nazis, especially for their Luftwaffe. He also knew that he was saying his last farewell to Paris when he set out for London on September 21, 1 938. His original intention was to go to the United States as soon as possible, but his friends in London - Naum Gabo, Barbara Hepworth, Leslie Martin, Ben Nicholson-gave him such a warm and heartfelt reception, found a studio for him, and saw to it that some of their friends bought paintings from him, that he began to feel completely at home. He had a little studio at 60 Park Hill Road, in Hampstead, very near the studios of Nicholson and Barbara Hepworth, where he was able to work quietly with­out being disturbed. But the war came to Mondrian and drove him out of London as he had feared he would have been driven from Paris, under the bombs of Nazi warplanes. At the end of September 1 940, after long hesitation, he left for New York. His stay in London had lasted almost exactly two years. During this time he had conceived a number of paintings, but had completed only a very few of them. Some of the paintings begun in London were found still unfinished in his New York studio after his death in 1944. Other canvases sent to him from London he did complete in New York. Composition London is a typical example of the pictures that Mondrian conceived shortly before he left England and completed in New York. It is dated, at the lower right, 40/42, and from this can be identified as the painting exhibited as No. 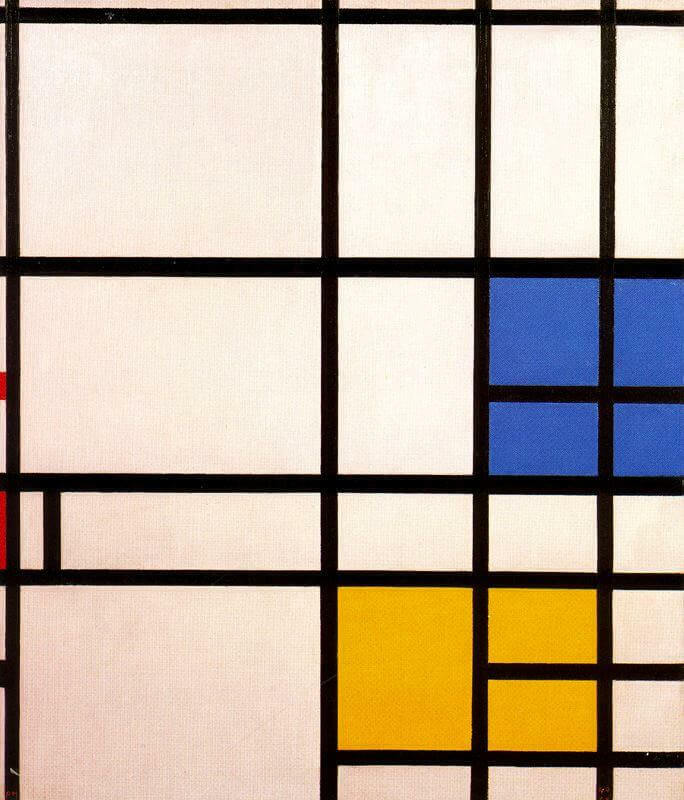 11 in Mondrian's first one-man show in New York in 1942. The changes he made in New York are all of the same sort: to compositions closely related to the canvases of 1936 and later, Mondrian added small, free-standing, unbounded areas of color. These colored areas give the whole a new vivacity; they break the strict, almost somber aspect of the pictures of the late thirties and introduce a new, lively, sparkling rhythm anticipatory of such works as Broadway Boogie-Woogie and revealing the same inspiration. The influence of the thirties remains, however, in the strongly asymmetric composition, with a concentration of accents primarily on the right. This asymmetry was to give way in New York to another, highly rhythmic compositional structure.